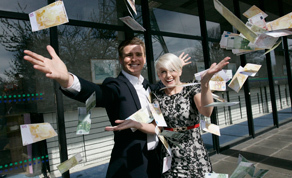 Brian Ormond and Sinéad Kennedy will become the new presenters for the National Lottery’s ‘Big Money Game’ TV show which will begin on Saturday June 9 on RTÉ. Despite the new presenters replacing former presenter Derek Mooney, the format of the show will remain the same, with much-loved money games such as Safe Cracker and the scratchcard game returning. Contestants on the show can win up to €25,000 and be in with a chance to go forward for The Big Money Game where the top prize is €250,000. In the scratchcard round, three winners will be selected every week to win a trip to New York with €2,500 spending money. Last year, €3.1m was won by scratchcard players and 55 holidays and 20 cars were given away on the game show. Brian Ormond previously presented the ‘National Lottery’s New Year’s Eve Millionaire Draw’ for RTÉ as well covering holiday leave for presenters on the ‘Big Money Game Show’ and ‘Winning Streak’. Sinéad Kennedy currently presents ‘Juice’ on RTÉ Two, and has previously worked on ‘Sattitude’, ‘Two Tube’ and ‘The Rumour Room’.